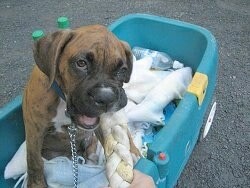 A day in the life with Bruno the Boxer puppy. Bruno's sixth week—12 weeks old, 24 pounds, 15 ½ inches from the ground to the highest point of the shoulders (the withers). About 2 1/2 months old. What a wonderful place to socialize a dog. Free parking, free admission, dogs are allowed, food is excellent in both taste and price, plenty of shade, and dog lovers everywhere. You are even allowed to bring your own picnic lunch. They provide an array of picnic tables which are relatively close to where you park your car. Hundreds of people came over to pet Bruno, from infants to seniors. The lights, the noises, other dogs; there was action going at every angle. Instead of pulling Bruno out from under that bench we should have guided him out, making him walk out on his own. Instead of picking him up we should have had him sit beside us and ignored him, making sure we felt confident and strong in our own minds. Bruno as a puppy would have felt what we were feeling and fed off of it. A canine animal has the ability to feel the emotions of other beings. Bruno would have felt our strength and that would have told him in this universal animal language that there was nothing to be afraid of. He needed to get over this fear on his own and learn that everything was going to be OK by feeling our strength. We, however, did the total opposite, and in doing so we created a dog with an anxiety issue. Who could blame us; if you do not understand this concept it would make perfect sense to a human to cuddle the fearful. We have been working on getting Bruno to stop being so afraid of thunderstorms. It would have been much easier to have avoided this issue, but it is still fixable. It will just take time trying to show Bruno there is nothing to be afraid of by staying strong for him when there is a storm, walking him out on the porch and just standing there together letting him feed from our strength. This has helped Bruno a great deal and he is slowly getting over his fear. There are just not enough storms in the season to practice this as much as we would like. If it were not for this puppy diary I would never have known where Bruno's fear of storms came from. Our progress so far…. After working with him he has improved. Now when we are with Bruno and there is a thunderstorm he seems to do OK. He sits near us and we ignore him. He no longer shakes. However, when we are not home he runs up the steps and hides, shaking in fear. We have come home many times finding him upstairs (a place he knows he is not allowed to be, but a place where he smells our scent the strongest). When we find him up there we guide him down and bring him outside and stand with him, not talking to him. Bruno sits with us on the porch and does not seem afraid even when there is a crack of thunder. It is when we leave and there is a storm that upsets him. This means that Bruno never learned to deal with storms on his own. This would be the direct result of us pulling him out from under the bench and holding him instead of letting him work it out in his own mind. That small act when he was a puppy made such a huge impact on him. I do not remember if there were other times this was done before we realized this is not how a dog thinks, but it is possible. More on Bruno's fear—Spencer the Pitbull Puppy: Reactions to the Fireworks. I could see Bruno was not going to last walking the entire day, and I didn't trust him enough to leave him in the RV, so for only $5 we rented a wagon. 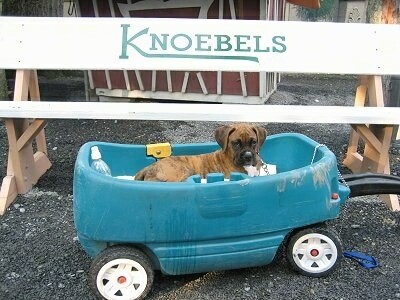 It didn't take long for Bruno to realize the wagon was for him. 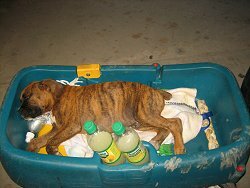 When we first put him in it we told him to "stay" and two of the kids walked beside him as I pulled the wagon to make sure he didn't jump out. For the first hour or so, Bruno mostly wanted out of the wagon and walked on his leash as the kids went from ride to ride. It was early in the day and he still had some energy, however as the day went on Bruno became more tired out. 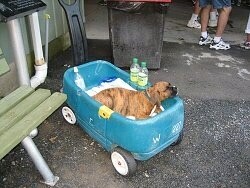 To my surprise, Bruno actually began to climb up in the wagon on his own and would lie down for a nap. We would pull him from ride to ride and he would stay in the wagon. He would wake up for a second wind, want out of the wagon and then back in for a nap over and over again. I would allow people to pet him even when he was sleeping. Bruno never minded this at all. Hundreds of hands, all day long, reaching out to pet him and he loved every minute of it. By the end of the night Bruno was beat, but still enjoyed watching people walk by. 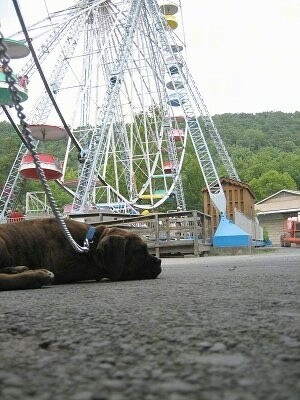 While at Knoebels, in the beginning, Bruno would try to jump on everyone who came to pet him. By the end of the night I noticed Bruno was no longer jumping, but giving them just one paw. I will accept a paw, but not jumping. Bruno was getting it. When Bruno would jump, I would tug his leash down saying "Bruno, Down!" Very often Bruno would lie on the ground. At first, I didn't understand why he was doing this—I simply didn't want him to jump, but was not asking him to lie on the ground. Later I realized the kids had taught Bruno the "Down" command. OK, time to change the jumping command to "No Jump" instead of "Down." The times Bruno would jump up, in most cases, after I told Bruno to get down the person petting him would state, "It's OK, I don't mind, I love dogs." However, it was not OK, because Bruno was not going to stay little. In a few months his jumping would become very annoying and may actually hurt a young child. Now is the time to teach no jumping. I received a tip on the puppy biting issue. When a puppy is play-biting a human, tap him under the chin and say "No Bite." If the tap does not do the trick, do it a tad harder until he gets the idea. Apparently dogs do not like getting tapped under the chin. This does seem to work if I can get my hand near his chin without him biting me first! At 12 weeks, Bruno has clearly outgrown his crate. He can no longer stretch out his legs. He has to keep them curled in order to sleep. Time to replace his crate with the next size up. Our original plan with the crates was to use this new crate when we first got Bruno and use the divider it came with to make it smaller. However, someone had conveniently given us a smaller crate so we were able to use the smaller one instead of the divider. Most crates come with a divider that can be adjusted as the puppy grows. Bruno is able to stretch out his legs in his new crate. Bruno in his old crate (left). Bruno in his new crate (right). Bruno was in the house playing with Allie, our older Boxer. We were watching Bruno closely knowing he might pee at any time. Sure enough, Bruno squatted and started to pee. I immediately went towards him yelling "BRUNO NO!! NO!!" Bruno stopped peeing. After taking Bruno to the grass outside, the proper place to pee..."Bruno, Go Pee!" Bruno squatted and peed in the grass. "Good Boy, Bruno. Good Boy." I hope this will make an impression on him and he will begin to really understand he is not to pee inside. 12 weeks and 3 days old. This morning Bruno yipped to come out of his crate. When I let him out, I realized there was warm pee on his bedding. Apparently, Bruno is a tad backwards. He wakes up, pees in his crate, then yips to come out away from the pee. He's only 12 weeks old, which is very young. At least the pee is in the crate where it's easy to clean up. 12 weeks and 3 days old. Bruno was inside playing with Allie, our older Boxer. I was watching him closely. He suddenly squatted and peed on the dining room floor. I went towards him yelling, "No Bruno! NO!" I put him outside and told him to "go pee." Bruno immediately squatted and peed, which means he had not finished inside. I had caught him and he had stopped mid-pee, which is very good in terms of helping Bruno understand where he needs to eliminate. 12 weeks and 4 days old. It was raining and Bruno was on the porch. I just happened to look over in time to see Bruno squat and pee on the welcome mat! "No, Bruno! Don't pee there!" Bruno stopped in mid-pee. I picked him up and plopped him down in the grass. "Bruno, Go Pee!" Bruno squatted and peed in the grass giving me that sulking look. "Good Boy, Bruno." Bruno still has a lot to learn—where to pee and where not to pee. The porch is outside, however it is not where you pee. Bruno is doing well considering he is only 12 weeks old. It's raining, so rather than go out to the grass where he will get wet, Bruno decides to poop on the porch. Time to hose the porch off. Bright side: at least it was not in the house, right? 12 weeks and 5 days old. For the first time ever, Bruno slept as late as 9 a.m.! I started to get a little worried and went to check on him. He was awake in his crate, but just lying there. I opened his crate expecting to find it peed in. However it was dry! "Bruno Outside... Bruno Outside." Bruno followed me outside. He walked into the driveway on his way to pee. He turned and looked at me once as he was walking as if he was thinking, if I pee on the driveway mommy will yell at me. He walked to the very edge of the grass and peed in the grass. "Good Boy, Bruno!" I feel like we are making some good progress. When Bruno is inside the house and he starts to wander around I get up and follow him. As of yesterday and today, when he looks like he is searching for a spot inside the house to pee, I notice him looking up at me and it's as if he suddenly remembered he cannot pee in the house. He looks at me as if I startled him. That's when I call him outside and give him the "Go Pee" command in the grass. Bruno may still have an accident in the house, however I see his attitude changing as if he is starting to understand. 12 weeks and 4 days old. Bruno is doing very well with the "Go Pee" command. I take Bruno out to the yard and say, "Bruno, Go Pee" and he knows what I am asking him to do. Usually, within one minute he squats and pees. This especially comes in handy on rainy days. Today is a chilly, rainy day, therefore Bruno will be spending most of his time indoors. I will need to take him outside to pee every half-hour to an hour and tell him to "go pee." 12 weeks and 6 days. Bruno has been doing extremely well with the "Go Pee" command. So well, in fact, for the last week when I would say, "Bruno, Go Pee!" and point to the grass he would walk over and pee within 30 seconds of my giving the command. Even if he didn't have to go very badly, he would squat and try to pee. For 12 weeks old, this is excellent. Suddenly, in a matter of a half-hour, Bruno became confused by the "Go Pee" command. 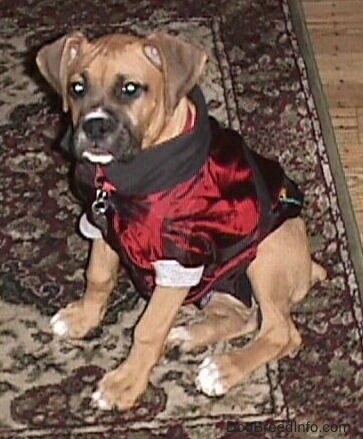 My 6-year-old Boxer Allie had to go to the vet in the morning. I wanted her to pee before putting her in my car. I took her outside and told her to go pee. Bruno was outside with us. I noticed Bruno had peed the first time I told Allie to pee. I had told Bruno "Good Boy," however Allie still had not gone. I kept repeating, "Allie, Go Pee. Allie, Go Pee" and pointing to the grass as I usually do. Allie was so excited she kept running back to the car without peeing. I would call her back to the grass and try again. Sometimes Allie would sit down on the grass and sometimes she'd run away from me, back to the car. Bruno was there jumping at her wanting to play. I was telling Bruno "No" and telling Allie to pee. Between the excitement of knowing she was going for a car ride and the puppy jumping on her, Allie would not pee for me. I was getting frustrated and it was showing in my voice, a big no-no when dealing with a dog. I finally realized I needed to give up and take her to her appointment before we were late. Later on the same day, I took Bruno outside and told him to "go pee" the same as I had done for the past few weeks. I could not believe it when Bruno acted exactly like Allie. He would not pee; he would either sit down or run under the car. I tried over and over but soon realized Bruno was totally confused from the morning episode. I had been telling Allie to pee while Bruno was there. Bruno had already peed for me the first time I asked him to. What Bruno didn't understand was I was not talking to him. I was talking to his older sister Allie. How to fix this: I believe the best way to fix this is to start over as if Bruno does not know the "Go Pee" command at all. 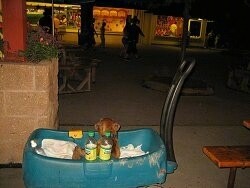 I need to do this for both dogs. Later on the same day I took both dogs outside. I waited for them to pee on their own. First Allie started to pee, so while she was in mid-stream I said in a sweet voice, "Good Girl, Allie. Go Pee. Good Girl, Go Pee. Good Girl!" Within ten seconds I notice Bruno squatting to pee, so in mid-stream in my sweet good boy voice, I said "Good Boy, Bruno. Go Pee, Good Boy! Go Pee, Good Boy!" The next day... I have been working with Bruno on his "peeing on command" and he is doing very well once again. I am careful to only say the command when he looks like he is going to pee anyway. I will have to do this for a few days to reinstate this command to him. 12 weeks and 1 day old. "Bruno, DROP IT! Those hand shears are NOT a toy!" Bruno miraculously finds anything left out that he is not supposed to have. He seems to take them to his dog bed, however, I wonder how many other things he took somewhere else that we may never find again, or find months or years from now! 12 weeks and 4 days old. I walked outside to check on Bruno, only to find him chewing on a dead bird in his dog bed! (Courtesy of the cats.) "YUCK. BRUNO! GROSS! Don't Chew On That!" Rainy Day. Bruno is inside a lot today. He lay down next to the cabinet and started chewing on its corner. "Aaaaatttttt!! NO!" Bruno turns and looks at me. Ten seconds later he's chewing the cabinet again! "NO, BRUNO, AAAATTTTTT. Don't Chew That!" Bruno lay down on the ground for a minute before he was back up playing with his toys once again. I walked outside to find Bruno had gotten into the fire pit. There were ashes on the porch and unburned pieces of logs in his bed. There was even a paint brush! I have no idea where he found the paint brush! I began to clean up the mess. I could not yell at Bruno as he would not understand why I was yelling. I didn't catch him in the act. The only thing I could do was yell if he started chewing on the paint brush or log again. I got out the broom and Bruno proceeded to bark at it, jumping around like a nutcase. He finds brooms very fascinating. I walked over to the fire pit where Bruno stole the logs and waited for him to go back in the pit. Sure enough, he did and then and only then was I able to explain to him that going into the fire pit was off-limits. "No Bruno, Get Out of There!" Bruno ran out of the pit. This was the first time he was told the pit was off-limits. Bruno ran to Waffle, the only cat out of 23 cats that seems to actually like him. Not sure if that one-time correction was enough to keep him out of the pit. Only time will tell. Bruno! Now what do you have? "No Bruno, Drop It!" Bruno stole Bob's safety glasses. Bob works here as a groundskeeper a couple of days a week. Bob says he put his glasses down for only a second and then they were gone. Turned out Bruno had stolen them! I explained to Bob now that Bruno is around you cannot put anything down or he'll take it. A few seconds after I had taken the safety glasses away from Bruno, he ran down to the yard and came back with the string that holds the safety glasses around your neck. Seems Bruno did some chewing on it. It was wet and slimy. Bob says Bruno is still his little buddy, even if he stole his glasses and chewed his strap. Bruno saw the vet today. He was a very good boy. He received his last series of shots, however because Bruno had an allergic reaction to his shots the last time, we gave Bruno a shot of Benadryl as well. Bruno sure was one tired pup for the next several hours!